This priority program seeks to ensure Austin’s continued economic health by developing a widely skilled workforce, recruiting new businesses, retaining and growing existing businesses, and tapping into our entrepreneurial spirit. In particular, this priority program seeks to increase job opportunities for Austin residents and increase small businesses and entrepreneurship. 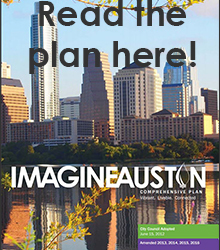 For additional information about this priority program, see page 193 of Imagine Austin, or contact the Planning and Zoning Department liaison. Taken as a whole, Austin’s economy has been the envy of many cities for its exceptional workforce, small business growth, entrepreneurship, and overall healthy business climate. The City of Austin continues to invest in the workforce, and has seen successes in attracting and retaining businesses while building a growing global reputation as an entrepreneurial center and job creator. Maintaining many of the investments, partnerships, and initiatives that have helped to create the environment for Austin’s emergence as an economic leader, the City has also made progress towards addressing many of the economy-related action items called for in Imagine Austin. But Austin’s recent economic success does not yet mean prosperity for all. The market forces that accompany an economic boom and rapid population growth have exacerbated the issue of affordability for many residents and businesses in Austin. Questions of equity - who and how many benefit from Austin’s prosperity - have resounded through the city and our community in recent years.